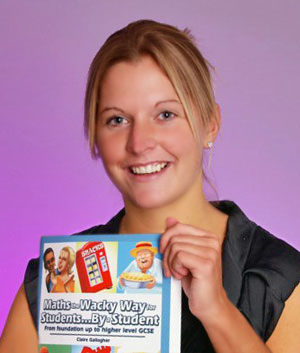 After completing her degree in ‘Maths & Accountancy’ Claire’s first job was with one of the big four international accountancy firms working as a Tax Adviser but continued to tutor maths privately in her spare time. Her book was published in June 2009 and her first three successful YouTube videos were released in March 2011 and now have over 600,000 hits. Claire currently works as a Senior Tutor and Learning Services Manager at Tolley Exam Training, part of LexisNexis, the premier provider of tax training services. She has very recently released a new maths course covering eight new topics with over two hours of content. Claire is also proud to be part of the Dragon’s Apprentice Challenge in Hertfordshire where she is supporting a team of year 12 students as their business mentor.